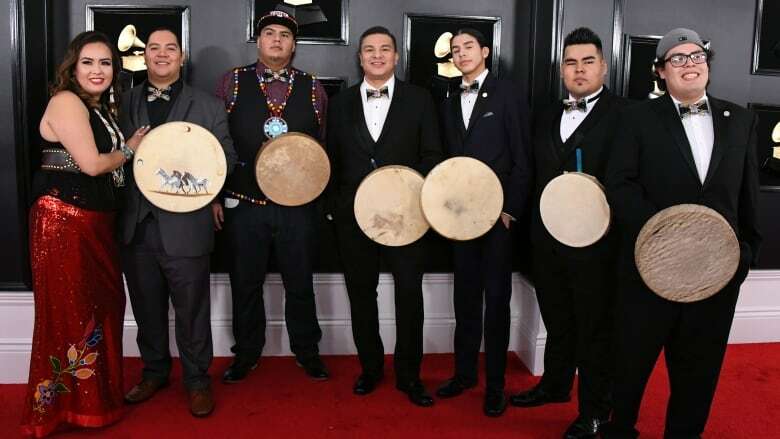 Members of Young Spirit turned heads on the Grammys red carpet Sunday night as they took a moment to stand and sing a Cree round dance song. "Our group's name is Young Spirit for a reason," said the group's co-founder Jacob Faithful. "And we collectively have all joined together to stand behind the mandate of keeping our culture alive." Young Spirit is made up of members from across Canada and the United States. The group is based in Frog Lake, Alta., but there are 16 singers from Alberta, Saskatchewan, British Columbia, Arizona and California. Faithful said when one media outlet asked to do an interview with them on the red carpet, he suggested they sing a quick song. Their album Mewasinsational – Cree Round Dance Songs was nominated for Best Regional Roots Music Album but lost to Hawaiian musician Kalani Pe'a's No 'Ane'i. "We want to inspire youth and young people everywhere across the globe to pick up the drum and sing our song," said Faithful. "Stand proud. Be proud of who you are, where you come from and what our people represent."